The NVX QBUS8v2 is a phenomenal exemplification of the best thing modern technology offers us - freedom. Freedom to roam, to communicate, and in our case, to enjoy the depth and richness of your music without adding bulky amplifiers and subwoofer enclosures. We realize there are people who aren't quite satisfied with a dull, lifeless factory system, but also don't care to set off car alarms every time they turn the stereo up. It was with this customer in mind that the QBUS8v2 was born. 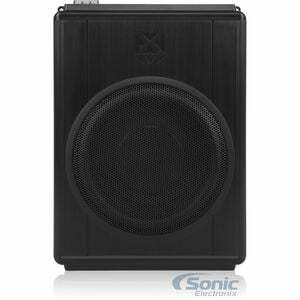 What separates the QBUS from other compact bass solutions is the acoustic performance and quality of the construction. While it won't shake your rear view mirror off, the low-end response of the QBUS is perhaps best described as strikingly powerful; the tight, crisp bass carries a strong presence without overpowering the more delicate frequencies. The included bass control knob allows you to quickly adjust the level of bass for different types of music. The beautiful thing about the QBUS8v2 is that it's a fully contained subwoofer system, consisting of an ultra-durable woven fiberglass 8” woofer driven by a highly efficient class A/B amplifier. These components are housed in a rugged aluminum chassis, specifically designed to offer incredible strength and protection while effectively dissipating heat. Best of all, the housing is less than 10” wide by 14” long, giving the QBUS a footprint about the size of a legal pad. At about 2.5” thick, it slides easily under the seat of most sedans and SUVs. If you have room for a book, you have room for bass. While spectacular sound quality and compact, rugged construction might be enough for some, we at NVX believe in designing products that are as easy and enjoyable to install as they are to use. The QBUS8v2 features speaker-level inputs with signal sensing automatic turn-on, allowing you to tap directly into your existing speaker wire without running RCA and remote wires. Adjustable input sensitivity, crossover, phase and bass boost controls make it easy to tune the sound to your preference. 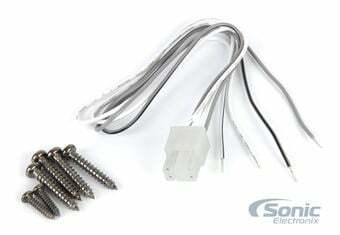 Silver-plated RCA connections and wire terminals ensure a tight connection with maximum conductivity. Best Value with More Features! If the final impedance of your speakers or subwoofers equals 2 ohms, this is how much power this amplifier will supply at that ohm level. The higher the RMS wattage, the more clean and loud your music will sound. 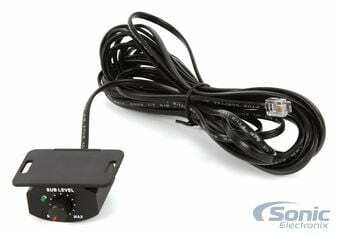 If the amp comes with a bass/gain remote you will be able to control the level of your bass from your dashboard. 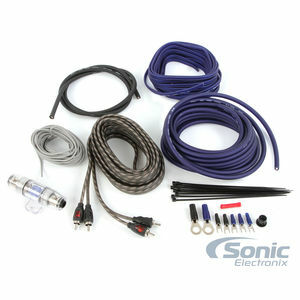 Typically bass remotes also include a 16-20 ft. wire for installation. Represents the style of the enclosure. Be sure to purchase the appropriate enclosure type and internal volume that will be compatible with your subwoofer's recommendation. Sealed - Sealed boxes are those that have no holes or vents in it. The only hole in a sealed box is where the subwoofer is installed. Smaller sealed boxes require more power than a larger sealed box. They provide a tight, accurate bass, while the larger sealed enclosures provide a "boomier" and louder bass. 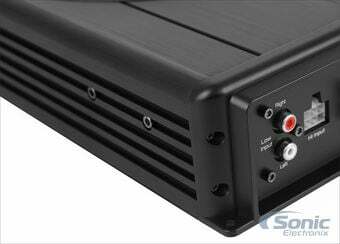 Ported / Vented - Ported/Vented Enclosures provide an even boomier, louder bass, but less accurate then a small, sealed box. Ported enclosures typically require more airspace per sub and also less power output from an amplifier to perform correctly. Bandpass - Bandpass enclosures make subwoofers perform efficiently, but loose. The bass is not as "boomy" as a ported enclosure nor as punchy as a sealed enclosure. Bandpass enclosures work well with lower to mid-level subwoofers. 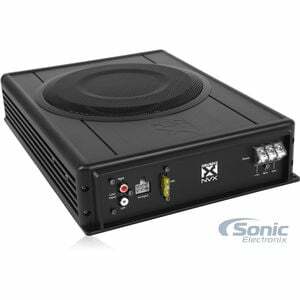 This value represents the number of speakers or subwoofers that the enclosure accommodates. The box style or shape refers to the actual shape of the box. 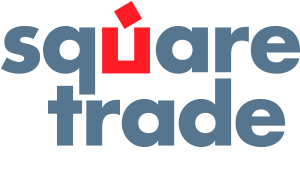 Square and rectangular boxes are straight-edged boxes on all sides, whereas hatchback and truck style enclosures feature an angled front or back design that allows for installation in places short on depth such as single cab pickup trucks. You can also use such enclosures in hatchback cars or other vehicles where space is a premium. Tube and cylinder shaped boxes were made popular by Bazooka and are a great option for those looking for a nice amount of bass without sacrificing lots of space. They may even fit in locations that slim truck boxes cannot fit in. If the enclosure is vehicle specific, we encourage you to read the product description to find out which vehicles the enclosure is made for. The number of terminals the enclosure has. Each terminal represents 1 positive and 1 negative. The color of the enclosure's exterior/outer finish. The material used on the outside of the box. Most boxes are carpeted to prevent exterior scratches; however vinyl is popular as it can often be color-matched to a near exact look of your leather factory interior. The first subwoofer I ever bought was a Bazooka Bass Tube 20+ years ago. It was an 8" amplified unit about 4 times bigger than this NVX. My how times have changed! For such a low price, I wasn't expecting much even though I had already bought 4 of NVX's NSP68 coaxials to replace all of my door speakers. I'm now definitely sold on NVX as a high-quality brand without a doubt. 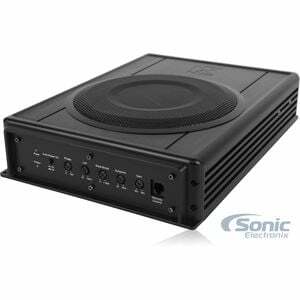 This subwoofer has an all-aluminum housing which is very hefty and immediately gives a good impression right out of the box. It has a sizeable amount of settings to integrate it with any sound system and can put out a surprising amount of bass for such a compact 8" unit. 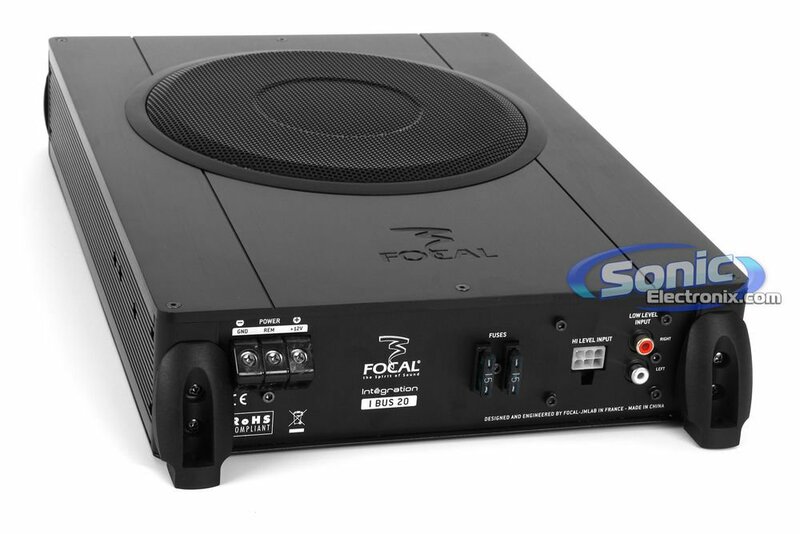 Focal sells an extremely similar unit for $550 and they are so close in design that I'd think that NVX must be producing it for them. 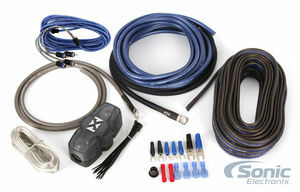 If you need a solid amount of bass for your OEM or aftermarket setup, give this unit a try! I have had a solid experience with the first one/version (Qbus8) for over a year now so it was really nice to be emailed that this new version came out. The first one is in my RAV4 under the front passenger seat and just thumps so perfectly. I am not a huge bass nut that wants to piss off the neighborhood or anything like that, but I do appreciate solid low-end to really fill the music in. This has done just that. The on/off test I show friends just amazes them. All of the good stuff about the first version, I was really frustrated that it was out of stock and then not available for so long. Patience is a virtue as they say as I had emailed NVX about it being unavailable and they said they would email me when it came in. I got the email about this new one and I bought it immediately. Wow. It is awesome. It sounds better, looks better, is smaller and was easier to install. Another thing I *think* I notice is the blue LED is not as obnoxious. Love it. This system is the perfect add-on to your factory stuff. In summary, this new one is in my Scion TC and my original one is in the RAV4. Both rock, but this is definitely an upgrade. Amazing sound from a small device! I wanted to add a little low end to my stock system so I took a chance on this enclosure. I wasn't sure what to expect, but when I finally got around to installing this I could not believe how much power this small thing put out. Once I got it tuned to my setup I was very happy with it. You are not going to win any competitions with this thing, and it's not going to rattle all of your windows off either, but it WILL add some good low end to your setup. This thing can over power your other speakers if you're not careful, so make sure you try the different settings to find what works for you. One more thing, the auto on feature is great! It was nice not having to run an extra remote signal wire to the sub. I tapped into the rear speakers in my truck and it has turned on and off flawlessly. For the price I highly recommend this! I give it 5 stars for everything. I had to give the durability category a rating, so I went ahead and gave it 5 stars as I'm sure this will last (so sure I'm thinking about getting another one for another vehicle). If this changes I will update my review. I bought this for my wife's Jeep Wrangler. I now have it outfitted all around withNVX. I mounted the QBUS8v2 up under the passenger seat in a down fire position. This thing sounds AMAZING! I have been wanting something that would not take up any room in the Jeep ( it's a 2 door) especially in what's called the cargo area. This fit the bill perfectly. It has amazing bass response for its size and great range. I have already recommended this to several people and everyone that has listened to it was astonished that I was getting that kind of sound out of this little 8 inch sub! Fantastic! lot of sound from a small box. very surprised with the big sound coming out of this sub. like the ease of getting to sound controls and relative easy install. I really like the compact design. I own a 2001 Honda civic ex 2 door so when i found an Amp and sub built in together I had to check it out. Cosmetics and look: It fits easily under my front seat so it saves the space in my trunk where a standard amp and sub box would go. Quality and Sound: for the size of sub (8") and built in amp it has a surprisingly great Sound, but not to much that it overwhelms the mid levels and highs. With it under the front seat the sound does not have far to travel or be a bit muffled by being in the trunk. Also, I don't get any radiling of my trunk lid or license plate. I travel a great deal for work doing construction so i have a lot of tools i need to carey with me at times, so giving up the trunk space was not practical for me but i still wanted a sub for the bass on those long drives to the job sight. this amp and sub combo is a good fit for what i wanted and what i could manage. It won't shatter any windows or shake the ground under your feet but it will give you some nice crisp lows and make any song you are listening to more enjoyable. Replaced a 10" Boss underseat with the NVX. This was a huge improvement, and does a nicer job top to bottom. this product exceed my expectation. Don't expect booming bass but it has enough bass for you to feel. Very impressed Sonic and I have built systems with just about every brand. First, keep in mind what this unit is. A compact design which emphasizes space saving over sound output. I have this installed in my 2 door Jeep Wrangler in the rear cargo area. I'm using my factory stereo and the QBUS8v2 does indeed fill in the lower frequencies missing from my factory system. The total output isn't going to overpower your mids and highs. 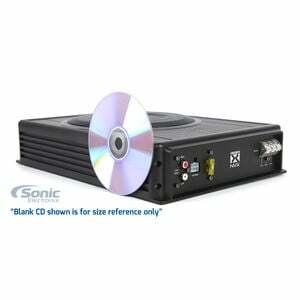 If you already have an amplified system I don't believe you will be satisfied with the output of this unit. This unit does run on the HOT side, so proper airflow is a must. Overall, it's a decent compliment to factory or non-amplified stereos. Perfect fit for my 03 ram single cab. Nice bump and helped even out my highs and mids. Quality setup. 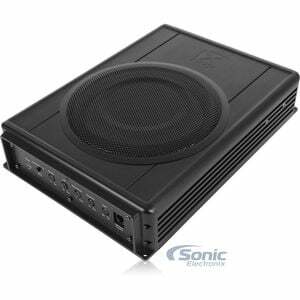 Amp, woofer and box in one, with a good price. Tight bass on the higher end of the spectrum, equivalent to other 8” woofers. Fits under the seat, but good looking enough to have in a more conspicuous area. Worth to add low end to my application of two-way speakers. 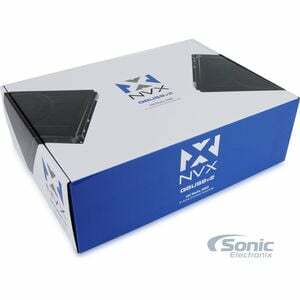 My underseat Clarion power subwoofer died - so, it was an easy process to swap it out for the NVX. The cons are that the remote control has fewer features but overall the NVX allows more tweaking of the overall subwoofer. The subwoofer does a great job filling in the sound in the cab of the Tacoma which has four 6.5" speakers and I would purchase it again. Awesome for limited space,limited modification installs ! I bought this for my mom as a Christmas gift, replacing a small ported 6.5in sub I had installed for him about a year ago and this thing is compact easy to install . and sound great !! First off let me start out by saying I never take the time to review products but this thing really surprised me! I would 100% recommend this little sub for those who need to just fill the sound that the speakers won't give you It definitely bumps for its size. 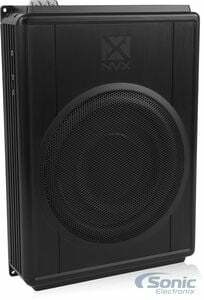 This NVX QBUS8v2 is by no means a monster, but it provides a great fill in bass sound that is perfect for the country music that i listen to. Currently installed in my 93 f350 extended cab truck, and would buy another one again. I used to have the Focal iBus20 but I got a new car and was looking for something less expensive. Luckily I came across the QBUS8v2 by NVX. Not only did I save hundreds but the QBUS8v2 made for an easier install. The sound quality and bass output is pretty much the same. I highly recommend it! Love this product. Have it in two of my cars. this unit is just what I was looking for my truck. has a great sound and it was so easy to install. But it does get hot so make sure you install it in a well ventilated space. It's a good bang for your buck! Made a big difference in my wife's 2001 Honda cr-v. The little bit of bass her car speakers could produce would always lose out to the sound of raod noise inside of the vehicle. She needed some extra kick on the low end but I still wanted her to be able to lay her rear seats down and use every ounce of cargo space without audio equipment in her way. This little setup fits good under the drivers seat, and produces some good sound for it's size. Definitely can hear and feel the bass now. It's not extreme by any means but there is definitely a noticeable difference. It's perfect for my wife and kids! This is coming from someone who runs a 2,000 watt rms system in his daily driver. I love this unit it's. So easy to install and sound Great I would Definitely Remcemed buying this unit look and sound as advertised. Slid this under the seat of a 2 door JK Jeep to take back some space. For a small under seat unit it sounds really nice. This will not give you big base but it will round out the bottom end of your sound nicely. It's too early to tell how well this will hold up but I'm satisfied with it. Got this sub to add a bit of bass to my stock system. Before I got it installed stock system (6 cd player in dash) died! Ordered a new deck from sonic and just got it all in. Sounds fantastic for an old guy's stereo! Thanks sonic for the great price and service! You are my new go to electronics seller. Put this in a single cab truck, plenty of bass if your not looking to rattle the windows, provides good love end bass. Only been installed a short time but so far it's great. I read reviews about this powered sub and gave it a try. I needed to add some bottom to my new setup and this fit the bill very well. I mounted the sub under the passenger seat of my '02 maxima. it works well with the Sony head unit, JBL 6.5 components up front and 6.5 JBL 2 ways in the rear doors. the bass is adjustable which usually stays less than a third turned up. this is not a window shaker but is good for that thump that wakes up the music 100% better than the stock weak system. this is great for someone that just needs to hear and feel a modest amount of BASS!! I would recommend this sub for those building a budget system. 30 days more or less and I enjoy it. 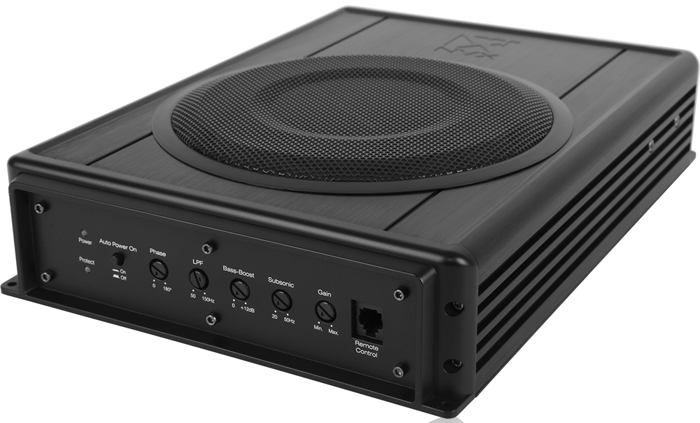 This is a compact 8" subwoofer that adds a little bass to the music. Works as advertised. Nice that it comes with a remote gain adjustment. Very easy to install but I has existing wiring. Could have used better schematics. Over all it really isn't a bad product it just isn't great. 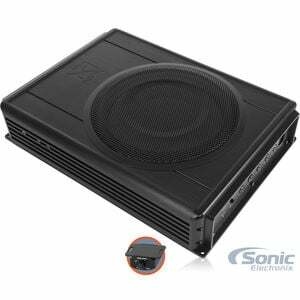 So how loud is it provided you are playing high frequencies and it isn't dampened by the bottom of your seat for 100 watts rms and being in such a small air space it has big output rattles the rear view a little. it gets really hot in my application. the mounting holes are entirely plastic I know because I broke one. 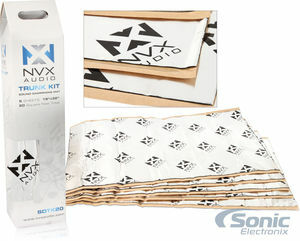 The deal that they are having where you get the nvx wiring kit for free when you buy this, that is one of the the best quality wiring kits i've ever seen. Needed a sub to round out my midrange tweeter component speakers. I don't need window rattling bass just something to fill out the low frequencies of my system. This product filled the bill.Easyto install and sounds great. I like the separate volume control as some sources have a different crossover and it is nice to be able to compensate. Good value! ???????? Works just fine for the type of music I listen to. It will not rattle any Windows. This sub will add the missing piece to any factory audio system. This small subwoofer surprised me. It was easy to connect, fit under a seat well and booms better than many bigger systems. I do not feel any competition exists at this price point with this quality. I bought this small sub to fit under seat in 1988 Chevrolet C1500 Silverado. I didn't have a lot of room and this fit nicely, added depth to my sound system (Sony head unit and 4 small 4 by 6 JBL speakers ). Sounds great considering the small speakers. The Sonic price was too good to pass up. Around130.00 and that included shipping and an installation kit. fills out the lower frequency on any system that lack bass. Only con is the knob on the remote is very small. Installed it in my 2012 Civic sedan under passenger seat. Fits perfectly. Sound quality is good. Not too over powering like trunk bass but powerful enough that I don't have to crank it up all the way. No complaints from passengers sitting on the seat. Remote control knob is handy if they feel too much vibration. Only negative is that install instruction is not that great. Auto turn on does not work if you are using RCA and turn on wire must be connected. I'd definitely recommend buying it. I bought this to replace a Soundstream USB-8 that died on me after almost exactly one year. The NVX has a really good sound and was easy to set, but it definitely does not have the punch of the Soundstreaam. If I had to pick between the two on sound alone, I would go with the Soundstrram, but given the reliability and the horrible customer service of Soundstream, I will never buy their products again. Overall I am happy with this speaker and would recommend it. If using it in a large vehicle, you might consider two subs. My bother-in-law had gotten an F-150 and was just sad about the lack of bass in his premium factory system. I did some research for him and decided to buy this for him as a X-mas gift. He didn't know what it was when he opened it up! I told him that I wouldn't install it for him, so he took it to a cartoys and had them do it. Needless to say, he could hardly contain himself once he got this little edition added to his factory system. He really loves it! I have been for a few rides since the install and it is a dramatic difference as far as low end for the music he likes. It is no substitute for the kind of bass you can feel from a dual coil monster magnet sub, but it is a excellent addition to those with limited space options or are looking to keep things mostly stock. Basic bass response but bottoms out with any bassy songs. Very slim and easy to fit under a seat. Flexibility settings for flat pink noise tuning. The remote is great for on the fly adjustments of the volume. Does not get very hot but needs airflow around it. This sub won't piss off your neighbors. But if you want to fill out the bottom end in a modest power or factory system you shouldn't be disappointed. I used it on my boat in the pilot house. The sound system used a 20 watt per Chanell car head unit with a pr of small Polk Audio "box" speakers. Made a huge difference. I have a 2014 ram 1500 and this box brings plenty of deep bass. I am very happy with the purchase. This has completely changed my mindset on NVX. 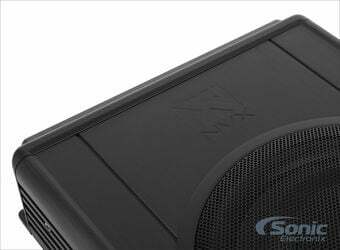 View all available accessories for the NVX QBUS8v2 Under Seat Powered Subwoofer Enclosure with Integrated Amplifier.